Please give a warm welcome to our newest contributor, Stephanie Matheson! 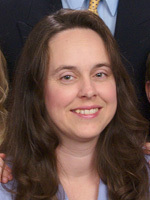 She is a pastor’s wife and a mother of five adorable kids. She makes her home in Millington, Tennessee and enjoys perfecting her crafting, cooking, baking and sewing skills. You will enjoy her weekly contributions of crafts and recipes. Her recipes, crafts, and sewing projects are in high demand. Stephanie is excited about an opportunity to share her creative creations with moms and women around the world. Try her new recipe today, and come back soon for more creative creations by Stephanie Matheson. For a mouth-watering, evening meal, try Stephanie’s most recent success—Smothered meatloaf! This recipe has proven to put smiles on even the biggest objectors to this classic main dish. Enjoy seeing your family’s satisfaction as they bite into this flavorful meatloaf! A few hours ahead of time, mix together all ingredients for meatloaf so the meat can marinate and absorb all those wonderful herbs. When ready to make loaf, line the bottom and two sides of a 2″ deep loaf pan with aluminum foil. Extend these two sides so you can fold them up and make handles. Leave the other two ends open. Doing so will aid in easy removal and clean up. Form the loaf in the lined loaf pan by kneading and pressing the loaf into desired shape. Melt butter, add mushrooms. Cook 4-5 minutes over medium-high heat. Sprinkle with flour; stir. Add the chili sauce, vinegar, lemon juice, and Worcestershire sauce. Cook until sauce boils. Let boil a few minutes. 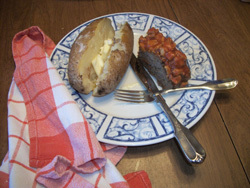 Serve sauce over meat loaf. Serve with potatoes, stewed carrots or your favorite veggie side dish. Do not cover with sauce. Make fresh sauce when reheating. Let the loaf cool. Then wrap with aluminum foil. Next, wrap with a couple layers of plastic wrap. Freeze for up to 6 months. When ready to serve, remove plastic wrap. Open the foil enough for steam to escape and place on a cookie sheet. Drizzle a little olive oil over the meat. This will keep it from drying out. Reheat at 350 degrees for 45 minutes. 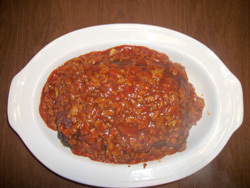 When the loaf is just about done, make the sauce and serve over prepared meatloaf. Don’t change the recipe. The herbs and sweet bell peppers will give the meat great flavor. Vinegar does not tame the wild flavor, it just adds it’s own pungent flavor.